The small and robust fan less embedded system RISE 4300 (DIN-Rail) uses VScom's Qseven-modules for the CPU core to take advantage of the latest processor technology towards smaller size, low power consumption and higher performance CPUs. Plenty of modern interfaces as well as its small mechanical design well suit it for compact performance applications, such as Factory Automation Applications, Network Applications and Communication Applications. 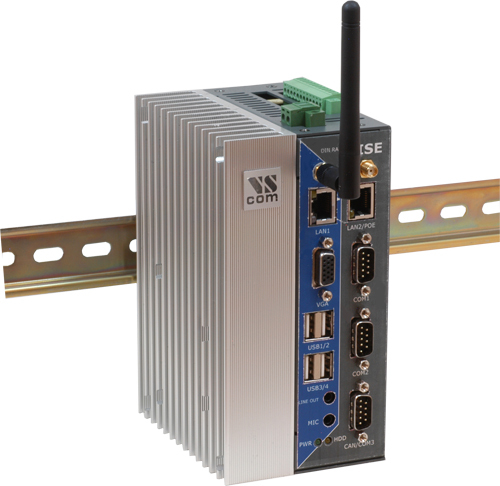 The Via Nano CPU (1.3 GHz) combined with 1GB DDR2 on board memory assemble an affordable system for compact demanding industrial applications. The integrated graphic unit (VIA Chrome9™ HC3) provides one VGA port. On chip GPU delivers graphics performance efficient for digital signage display and Video Playback. The connectivity includes 2 x RJ45 GigaLAN, 4x COM port, 4x USB 2.0, Digital I/O, CF expansion slot, Express Card 34 slot, and an 1.8" HDD/SSD bay. One integrated Mini-PCIe slots can accommodate WLAN (or 3G/4G-Modem) cards. 10-30V DC input power supply, wide temperature operating range and ruggerized compact steel housing recommend it for deploying in harsh industrial environments. Up to 1 Mbit/s (theor. 12 MBit/s).